This past week since my last post has been awful! 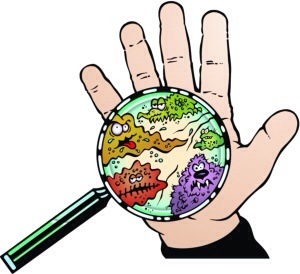 My house has become a breeding ground for nasty, horrible, incredibly infectious germs. No one has been spared the wrath of illness! Baby boy was ill last week with a virus and although he perked up he was never 100%. Please excuse the detail but his nappies have been awful, he has been sick a lot more than usual and his sleep has been terrible. Now call me naive but it never even occurred to me that he would pass his illness onto me and Mr K. How silly of me! It was friday morning and I was at work. All was going well until out of no where I started to feel nauseous. I got up to make a dash to the toilet, realised that there was no time and had to make do with the bin! I was mortified. I was promptly sent home and told not to return until I was better. Now luckily Mr K’s mum was at my house looking after baby boy. She sent me to bed and stayed for the whole day until Mr K got home. I am extremely thankful for this because there is no way I could have looked after baby boy myself. I spent the rest of the day either asleep or in the bathroom. I woke up at about 11pm to find that Mr K had now started with this disgusting bug as well. It was a long night! Yesterday was not a good day either. Neither of us felt well but baby boy was giving us no let up. He was extremely active and extremely grouchy. Not a great combination with 2 ill parents. We are all feeling a little better today which I am grateful for. I don’t know if I could have handled another day like yesterday. I plan on keeping away from other people though. Lack of sleep has turned me into an extra from the walking dead and no one needs to see that! I’ve said before that I know that baby boy is going to pick up a lot of bugs as he grows up but now I realise that he is also going to share them. I can’t say that I am looking forward to that! How do you manage when everyone in the family is ill? It was horrible. I’m so glad that my mother in law is amazing! I couldn’t have gotten through that first day without her. Perhaps this makes me a shoddy parent but when we are all sick (happens less often now that they are older) the TV becomes our best friend. As do any electronics to keep the healthier children occupied, out of trouble and within reach. Extra help never hurts either so we do not hesitate to infect the grandparents either! Did mr. Ks mum get it too? If baby boy enjoyed watching tv yet then I would have certainly used it. No Mr K’s mum didn’t get ill but his dad did so she must have been a carrier.